Your Position: > Knowledge >> solar controller >>> What is a solar regulator and what is its job? 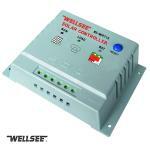 Most people who have anything to do with solar power know that a solar regulator is necessary. Not too many of these people understand the exact function of a solar regulator or how it does what it does. For the purpose of this discussion and unless I state otherwise, I will be talking about the excellent PL series regulators from Plasmatronics. These are some of the most sophisticated, flexible and full featured regulators currently on the market. However, if you strip away the fancy features and displays, the PL series regulators carry out the exact same basic task as almost all of their cheaper and less sophisticated cousins. So what does a regulator do? If we were to look at the job description of any solar regulator, the first item (and in some cases the only function) is to prevent the battery bank from being over charged. The regulator does this by simply disconnecting the solar panels from the battery. So at a really basic level, the regulator is just a switch. Plasmatronics PL40It is however a switch with a brain. Clearly we want the regulator to disconnect the solar panels only when the batteries are fully charged. To do this it must employ some intelligence and have some understanding of battery technology. The dumbest of regulators simply watch the battery voltage until it reaches the regulation point (battery maximum voltage) it then switches the panels off. Most regulators have a bit more smarts than this. With some understanding of how batteries like to be charged, it is more reasonable to allow the battery voltage to rise to the regulation point, then carefully regulate the charge from the panels to hold the voltage at this point for a time (normally 1 – 2 hours). This is referred to as the absorption phase. This absorption phase typically takes the batteries from 92% up to fully charged. After this absorption phase is complete, a smart regulator will drop down into float mode. In this float mode the regulator is letting just enough charge from the panels through to the batteries to keep the battery voltage up at its float point. 1.Bulk – push as much power into the batteries as possible. 2.Absorption – control the charge to hold the battery voltage at a point for an hour or two. 3.Float – maintain the battery at close to full charge by controlling the charge and holding the battery voltage at a preset point. So we have talked about the basic function of a regulator, but what other features and fancy bits? Most regulators present some kind of information display. At the most basic level this is simply a couple of colored lights that give you some idea of the stage that the regulator is currently in. The PL series (and others) have LCD displays that provide a huge array of information about what is happening and what has happened. The PL series holds basic data for 30 days. This means you can step back through 30 days of historic data and see what has been going on with your system during this time. Monitoring: By adding a shunt to your system, the regulator can “watch and record” the power that you use from your batteries. This allows the regulator to have a complete picture of the solar/battery system. If it can “see” all the power that is going into the battery AND all the power that is coming out of the battery, it is not difficult to calculate how much usable power remains in the battery (assuming you have told it how big the battery is). The PL series display this information on an often misunderstood screen called the SOC% (state of charge). Here are some other features of the PL series of regulators that I think makes them worth the extra few dollars. 30 day history stored within the regulator. Ability to track power used by high power appliances (such as microwaves etc) by using one or more shunts. Ability to track charge provided to the batteries from the solar panels separately from charge supplied from other sources (eg generator or wind turbine). 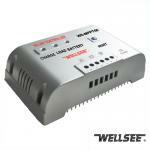 Can be programmed to automatically start a generator or sound an alarm when the batteries are critically low. Add on devices available to allow connection to a computer (for configuration or data download), modem (for remote monitoring). Can disconnect the load (things using power) when the battery voltage is critically low.